All Thumbs Reviews: Your latest family portrait? Take it up a level with Easy Canvas Prints. Your latest family portrait? Take it up a level with Easy Canvas Prints. A year ago a company named Easy Canvas Prints asked to advertise on my main blog and we did a switch-out: I got a canvas print and they got space on my sidebar. I am under no obligation to write a review, but because of the happiness the print brings me every day, I do want to shout the company's praises from the rooftops. Or from Blogger, as the case may be. Last spring my friend Mary Beth took a series of family photos in the lovely and quirky downtown Denver environs. We are not great at ordering, framing and hanging our photos (a digital picture frame is about all we seem to manage), but when the chance came to order a canvas print, I jumped. 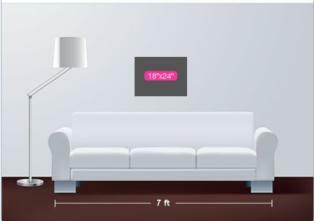 My problem then was, which of the gazillion shots MB had taken would look best as a 2x3 foot print over our couch? Pardon the facelessness. Trust me, they're cute. Choose your size, from 8" square ($30) to 24" x 36" ($110) and six sizes in between. Custom sizes can also be accommodated. Decide how deep you want your print, either ¾" (standard, like mine) or 1½" (add $14). You could instead choose to add a frame. Upload your photo (from your computer, from Facebook or Instagram -- make sure the image is yours to use). 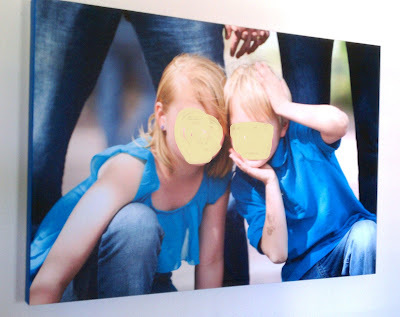 Easy Canvas Prints will let you know how well the image will work your final product. Select how you want your border to look (the ¾" or 1½" you selected above). You can wrap it, mirror wrap it or choose a complimentary color as we did. You'll get to see what each option looks like. Choose any special effects like black & white, sepia, or touch-ups. Wait eagerly for your newest family heirloom to arrive. Right now, Easy Canvas Prints* is offering a 25% discount. No word on how long that deal will last, so if you've thought about turning an image into a print, now may be the time. You'll notice the discount at checkout. *affiliate link. I do like this company's products. We just had family portraits taken and have all of them on a CD with full rights to all of them. This is a GREAT idea. Thanks for sharing it.